In recent years, the field of picture archiving and communications systems—PACS—and image informatics has advanced due to both conceptual and technological advancements. 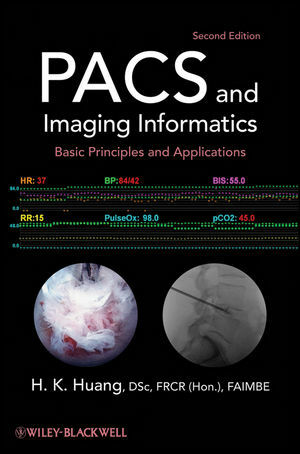 This edition of PACS and Imaging Informatics: Basic Principles and Applications addresses the latest in this exciting field. In contrast to the previous edition, this updated text uses the framework of image informatics, not physics or engineering principles, to explain PACS. It is the only resource that thoroughly covers the critical issues of hardware/software design and implementation in a systematic and easily comprehensible manner. With the most systematic and thorough coverage of practical applications available, this text is the complete guide for all those involved in designing, implementing, and using PACS. Professionals in medical and allied health imaging informatics; radiologists and their technical staff; surgeons and oncologists and their teams; medical and electronic engineers; medical informaticians; and fellows, graduate students, and advanced undergraduates will all benefit from this valuable resource. "An excellent book for people involved in the design, implementation, or simply the operations of PACS and an appropriate textbook." "The strength of the book lies in the vast experience of the author, who has implemented PACS at numerous institutions in the United States and abroad." H. K. (Bernie) Huang, FRCR(Hon. ); FAIMBE; Professor of Radiology and Biomedical Engineering; Director, Division of Imaging Informatics, Department of Radiology; and Director MS Program, Medical Imaging and Imaging Informatics, Department of biomedical Engineering, University of Southern California, Los Angeles, Chair Professor of Medical Informatics, The Hong Kong Polytechnic University; and Honorary Professor, Shanghai Institute of Technical Physics, The Chinese Academy of Sciences. PREFACE OF THE LAST EDITION. H. K. HUANG SHORT BIOGRAPHY. PART I MEDICAL IMAGING PRINCIPLES. 2. Digital Medical Image Fundamentals. 5. Four-Dimensionality, Multimodality, and Fusion of Medical Imaging. 7. Picture Archiving and Communication System Components and Workflow. 9. Industrial Standards (HL7 and DICOM) and Integrating the Healthcare Enterprise (IHE). 11. PCS Server and Archive. 13. Integration of HIS, RIS, PACS, and ePR. 14. PACS Data Management and Web-Based Image Distribution. 16. Fault-Tolerant PACS and Enterprise PACS. 18. PACS Clinical Implementation, Acceptance, and Evaluation. 19. PACS Clinical Experience, Pitfalls, and Bottlenecks. PART IV PACS- AND DICOM-BASED IMAGING INFORMATICS. 20. DICOM-Based Medical Imaging Informatics. 21. Data Grid for PACS and Medical Imaging Informatics. 22. Multimedia Electronic Patient Record (ePR) System. 23. Multimedia Electronic Patient Record System in Radiation Therapy. 24. Multimedia Electronic Patient Record (ePR) System for Image-Assisted.Spinal Surgery. 25. Computer-Aided Diagnosis (CAD) and Image-Guided Decision Support. 26. Integration of Computer-Aided Diagnosis (CAD) with PACS. 27. Location Tracking and Verification System in Clinical Environment. 28. New Directions in PACS and Medical Imaging Informatics Training. PACS AND IMAGING INFORMATICS GLOSSARY.